Chuck and Cindy Smith pride themselves with the experience and knowledge they have in the jewelry field. Both Chuck and Cindy have 40 years of experience in retail jewelry as well as continuing education courses, make their expertise unapproached by many. Chuck completed Ray Martin Jewelry Repair School I and II in 1976, Homer Holland Jewelry Casting and Design in 1984, Swest Casting workshop in 1987 and trained in laser welding technology in 2005. Chuck’s many years of experience at the bench has produced outstanding work in hand carving, waxes to specific designs, flawless casting, excellent stone setting and years of experience in restoration of antique pieces. Cindy graduated with a BS degree in Marketing at the University of Florida. She completed Gemological Institute of America Diamond Grading course in 1986 becoming a registered jeweler with the American Gem Society in 1987. She has many years of experience in designing special, one of a kind pieces of jewelry customized for each client. In 2006, Chuck and Cindy both completed course in CAD design (Computerized design), which brings state of the art technology to the designing field. Your special design can come to life on screen in 3-D. Tweaks and corrections can be made before that special piece is finalized. Cindy’s years of experience in the jewelry industry plays out when she looks for a rare or unusual piece of jewelry. Cindy has a love of beautiful stones, diamonds, uniquely colored diamonds, and colored stones that show when she selects that perfect stone for you. Watch repair, including certified repair of Rolex, Omega, etc. 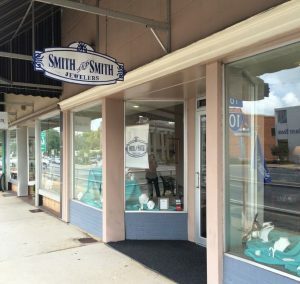 Smith and Smith Jewelers Inc, is a family owned business located in Historic Downtown Marianna. Visit us in our store or online. Facebook or Instagram. Choose the perfect item and put it on layaway with easy payments. The plan is a third down at purchase and a third of the balance over three months. No penalty for early pay off. Can’t wait to wear that perfect piece you picked out. Look into our easy financing options! 90 days same as cash, or financing up to 60 months. Terms do apply. Please contact for details. Quick fast credit approval.